Got something you want us to answer next time? Send it in! The winners of the last mailbag's Animal Crossing "Mario item giveaway" are at the end of this mailbag. Hey great site and all (mario rules!). I was just wondering if ne of u have ever sent an e-mail to the people at nintendo power n if u did, did they put it in there magazine? thanx. I'm really into Mario Radio! But the playlist is somewhat small. I've been listening to it for about a week and basically know what song is next, lol. Anyway, any chance of an update to the playlist? The songs you have are already great. Keep up the great work! I plan on updating the playlist soon, because I have a bunch of Mario RPG and Super Mario Sunshine songs to add. David Dayton: You know, I keep meaning to put more stuff up on it as well. The problem I have is that we changed servers, and I really never figured out how to correctly upload stuff to the new server. I was looking in the SNES MArio Cameo games, and in Kirby's Super Star, you say you can see Mario, Luigi, and Peach, But you DID NOT say you can see BIRDO above Mario! Deezer: You're right, I didn't mention that one can see Birdo above Mario, but I did mention that Birdo was there, at least. David Dayton: I second that motion. I will say that it is neat to have a Japanese TMK fan visiting. Do you have a scan of the 1-page interview with Shigeru Miyamoto? If so, would like you to please send it. Deezer: Don't have anything like that, sorry. David Dayton: Which interview are you talking about? I do know that The Miyamoto Shrine has a lot of interviews, so that might help you out. David Dayton: Although I could be wrong, I think it is more likely we'll get the same Panel de Pon the Japanese get this time. Hey what ever happened to Super Mario 64 2, they said they had plans to create the game BEFORE the end of the N64 era....and yet it never came to be! Please explain this to me. P.S. Will there ever be a game that reunites Mario, and Luigi in an adventure like in SMB3? Deezer: I don't remember exactly. I think since they were already working on GameCube at that point, they decided to wait, and the game turned into Super Mario Sunshine. But I'm not sure, Maybe David knows more details? David Dayton: I also remember something about Super Mario 64 2 being started. It was supposed to be for the 64 DD. I also remember that when Shigeru was later asked about it, he mentioned the 64 DD's struggle had sort of delayed it. He also mentioned that the game had changed a bit, and that they had demos of Luigi running around on their development screens. Miyamoto said that an observer might think the entire game revolved around Luigi. These comments make me think that Luigi's Mansion spawned off of the early SM64 2 ideas. Hey, your site is pretty cool, and the page with all of Mario's game appearances was very entertaining. I've played the SNES Zelda games several times, and I never once noticed the picture in the houses was Mario. You've certainly got a lot of great stuff, but I'm suprised you don't have any GIFs available to color in. They must be hard to find though, because I've not had much luck searching on the Net. Deezer: You mean black & white images that people can print out and color in? That's a good idea. 1.who is your fav mario charater? 2.the fan art is kind of weard....are those japanese virsons of the mario crew?peach and bowser look so weird! 3.how long before super mario advance 4? 4.do you think toad will get his own game? 5.do you think peach will get her own game? 6.you shound ad a game ideas thing to your list.dont you think? 7.can you make a link to a mario game selling site besides ebay? thanks alot! 2.The Mario characters look the same in Japan. The difference in fan art is a result of people's different drawing styles. 4.He already did, sort of. But do I think he'll get another starring role? No. 6.I'm not really into that kind of stuff. Plus I think it would give people false hope that his or her ideas will be used by Nintendo. David Dayton: 1) Luigi, I think. 1-In animal Crossing, are Timmy and Tommy (the racoons that work at Nookingtons) related to Tom Nook? 2-Do you think Nintendo should make a sequel to SSBM? 3-I saw that Luigi`s Mansion bug that was mentioned in a previous mailbag where Luigi`s shadow apears to be hanging from a noose. Well, I didn`t see any noose. It looks like the shadow just "jumps" to the wall. It might look like a noose because the lamp is in the way. 4-I`ve searched everywhere for the universal codes for the Mural Wall, Green Pipe, and Brick Block. I just need those three to complete my collection. do you know the codes? 5-I noticed something wierd about the Animal Crossing Luigi Trophy. It looks like the trophy has it`s tongue sticking wide out. Is this true? Well, that`s all for now. Your site is awsome! See ya! 1-I think they're supposed to be his sons? I haven't heard for sure. 2-At this point, I don't care either way; I played SSBM so much that I don't want to play it again. 3-David was going to check on that, but I don't think he got around to it. 4-A code for "Brick flooring" was found... I don't have it handy though. 5-Hmm... I didn't notice anything like that. David Dayton: 1) They are his nephews. 2) Yes, although I really don't know what they could add, other than Wario. 3) No idea yet. 4) Yes, yes I do. 5) I don't think so. As a huge fan of the falling-block-puzzle-game genre, I have mixed feelings about the Puzzle Collection coming out for the Cube... do you think there will be any other games included in the collection besides the three that have been reported already (Yoshi's Cookie, Dr. Mario, Tetris Attack)? Perhaps as hidden rewards or something? "Yoshi" for the NES was a terrific game, and the SNES version of "Wario's WOods" is far superior to the NES version that appears in ANimal Crossing. Also, I don't know if Nintendo still have the lisence for the NES version of Tetris, but if so, they could throw that on the disc too. It just doesn't make sense to release a collection of Nintendo puzzle games without being complete about it... Any thoughts? David Dayton: Well, those are the most popular Nintendo designed puzzle games. It's hard to think of any other Nintendo designed Puzzle games, other than Yoshi and Wario's Woods. Perhaps we'll see those as well, eh? Yo guys. I'm new to this site, and recently found out about it while searching for "Metroid + Samus without her suit". Talk about seemingly obscure, huh? Anyways, I delved deep into this site, and while exploring your joyous establishment, I discovered AN ERROR. Yep. You guys forgot the PC port of Mario's Time Machine. I personally own the game, so that's why it kind of popped out right in front of me. If you need screen shots or anything, I'd gladly divulge them. I personally prefer the PC version, because you get to hear Mario's voice for the first time ever. Yep, before Charles Martinet: There was "some guy". The voice ain't so bad, actually. A lot less overdone then Mario's current voice. Not really Italian, but reminiscent of the Super Mario Bros. Show! P.S. Do you guys know where I could get a Video/DVD of the Super Mario Bros. Show? That thing glued me to the set and allowed my parents to actually get stuff done. Deezer: D'oh, would you believe I listed it on the "Other platforms" page, and never uploaded the page? I'll do it now. There we go. I believe Amazon.com and BarnesAndNoble.com still sell that one cartoon collection DVD. I've also heard reports of Best Buy carrying the same DVD. I found another Mario reference, but I'm not sure if it is in the Mario references section, but I'm not checking, because I use a 56k and don't really want to waste much time. In Ghostbusters II, after the scene where that Ghostbuster guy is at that date, Rick Moranis (not sure if I spelled it right) asks the Ghostbusters secretary, "Want to play Volleyball, or Super Mario Bros.?" They are not on the air yet, but it is an actual station. David Dayton: I told you we should have gone with KTMK. Greetings! I don't know if you would remember me from a mailbag quite a ways ago, but nevertheless, I have returned to provide some more valuable information! On the subject of the "hand boss" of Kirby Super Star, yes, that is Wham Bam Rock. He is the final boss of the Great Cave Offensive, but reappears as the boss of Cavios in Milky Way Wishes. Basically, a face watches Kirby from the background as a giant stone hand performs various attacks, such as slamming, punching, grabbing, finger-walking, and finger dropping. And yes, in the Super Smash Brothers series, several of Master Hand's attacks are reminiscent of Wham Bam Rock's. It seems that every once in a while, someone on the SSBM message board on GameFAQs tries to claim that they are related... although since HAL made both game series, I think that MH is just supposed to be a reference to WBR. As for Damimster's question about the "blue circle" in Super Mario Sunshine... I think the manual explains that this happens when Mario is standing so that there is a wall between him and the camera. Basically, instead of the wall blocking your view, the screen turns a blue color except for a normal-colored circle in the center of the screen (similar to the effect that occurs when you use the Lens of Truth in Legend of Zelda: Ocarina of Time). Now for the question of the BowWow in the Game Boy Advance version of Legend of Zelda: Link to the Past... it's mentioned in the January 2003 issue of Nintendo Power (BTW, I so enjoyed the SSBM orchestral music CD!) I don't know the exact details, but one picture of the Four Swords game has BowWow inside the item icon, and one of the Links is walking around with BowWow tagging along like in Legend of Zelda: Link's Awakening. The caption suggests that not only will BowWow attack enemies, but he can also shake Rupees out of the other players and eat them, perhaps adding to the number collected by the player using him. I THINK that's all I wanted to say. "Until next time, everybody... do the Mario!" WHAT HAPPENED TO PAULINE FROM DONKY KONG? Deezer: After Donkey Kong, Pauline appeared in Pinball and GB Donkey Kong. Since then, she hASN'T BEEN OH NO I CAUGHT YOUR CAPS LOCK DISEASE SOMEONE PLEASE HELP ME AAAGGGH. Deezer: Wart Jr. was one of the first new arrivals to my town. I never thought of Wart and Wart Jr. being any more of a coincidence... but you could be right. It's interesting nonetheless. David Dayton: I never met that one. We should get a screen shot of it. I do think the fact that the apes look like DK is interesting. This is such a cool website, just wanted to tell you. Recently, I came upon a glitch early in Super Mario World. Coming out of a stage in the Donut Plains, the green Yoshi Mario was riding on turned gray! The gray Yoshi has the same ability as a yellow Yoshi, but can be found before red yellow and blue. I had a movie of this, but someone deleted it, and I can't remember how to get one again. Have you ever seen this gray Yoshi before? Deezer: Can't say I have. Maybe someone else can shed more light on this...? "P.S. Setzer is cool. Anyone that throws playing cards as a weapon is cool." David Dayton: No. Not at all. Batman and the Green Lantern are the only comic characters worth caring about. Aside from Scrooge McDuck, of course. Deezer: Aw man, comics were my big obsession before Mario. In the Jan. 10, 2003 mailbag, "Damimster" poses a question about a "random blue circle" in Super Mario Sunshine. This circle is hardly random, though - it only appears when the camera is behind a solid wall and has to show the scene as it actually is. Kudos on the site. Much fun to be had boning up on my Mario knowledge. "In Mario Sunshine, there is a random blue circle that sometimes appears on screen (like that of the Lens of Truth in Zelda), what does that indicate?" No, those are not lens flares. The camera in Mario Sunshine does two semi-weird things to deal with objects in the way. If the object is between the camera and Mario, a shadow-like silouette will show where he is. But if the camera ends up behind or in a large obstruction like a building, the camera uses the "big blue circle" thingie to deal with it. That happened a lot when I was trying to get the ferris wheel thingie to work, and walls kept getting in the way. Actually, Damimster, Deezer, and David... that blue circle appears if you get "trapped" behind a wall and the camera can't see you at all. Deezer: Ah. I never experienced that. Interesting. 1. The gun. Instead of shooting rocks from his finger, though, rocks fall from the top of the screen. 2. The simple pounding attack. 3. It's hard to see in this picture, but he drops parts of his fingers on Kirby, like Master Hand's bomb attack. 6. This is where he picks Kirby up and does some damage. 7. He launches his fist from the side of the screen. I got Animal Crossing for Christmas, and I love it. Louie is in one of our two towns, and for some peculiar reason, both towns have six-letter names! And so do the islands!!! Anyway, I wanted to know: what exactly is Arlo? It's listed as a trophy in the official Super Smash Bros. Melee strategy guide, but it doesn't really exist. And another thing: Nintendo Power said that there is no trophy you get from playing SSBM when you have a Super Mario Sunshine save. Sure enough, I haven't gotten one. But then, what is the Mario Riding Yoshi trophy? A fake screenshot? It has to be in the Japanese version, WHY OH WHY isn't it in the US version? My characters in Animal Crossing are: Tendo in Jicien (the town in my GCN, get it? ), and Kazuki in Ludlow. Deezer: I know not of Arlo. The Mario and Yoshi trophy is in the game, but so far is only available at an upcoming(?) Toys "Backwards R" Us event in Japan. Yes, Bow Wow is in the Four Swords game. He is picked up like any other item used in the game. I didn't actually get to do a whole lot with him (mostly because I kept letting him out to sick my brother, heeh heeh heeh) but I can tell you it was a 2 player game and we only found one. Deezer: I'll pass the info on to David. David Dayton: I've only played through Four Swords enough to enable the extra dungeon in Link to the Past. I shall have to play it some more. "I was in the middle of a great catnap when I saw you in the strangest dream. You were on a tropical island with a water pump on your back." Wow. That Chargin' Chuck Yoshi glitch also just happened to happen to me about two weeks ago! I lost Yoshi on Forest of Illusion 3 then, about two seconds later, went down the pipe near the end. I came out the other end of the pipe on a "Yoshi" that was actually a floating Chargin' Chuck head and a Amazing Flying Hammer Brother hammer graphic in the feet area. It looked weird but had all the functions of a Yoshi. I kept it all the way through the Chocolate Fortress but lost it afterwards. Also, the graphic on the world map was not a "cloud," but actually a flashing/flickering Yoshi graphic. Anyway, it's in there. Deezer: A strange thing, that bug is. Im so confused with this whole Donkey Kong thing. could you guys help me out a bit? If the Arcade Donkey Kong is now "Cranky Kong", and the Arcade Donkey Kong Jr. is today's "Donkey Kong", Who is today's Donkey Kong Jr.? Oh, and another thing. All i have to do is get a duplicate VHS of my Mario Bros. cartoons. I kept asking you so many times of where i send it. Since i see Deezer talking about sending things to MEGAߥTE, what's his address? Deezer: Bah, who knows. Um, I don't think we'll be hosting videos of the Mario cartoons, seeing as how there is at least one other site already handling that. Sorry. David Dayton: I think that the current story is that the current DK is the original DK. Cranky Kong is his grandfather. This doesn't explain Cranky's jokes and comments during Donkey Kong Country... although I'm curious as to how they were translated in the Japanese version. Does the Japanese version of DKC keep the idea of Cranky being the original Donkey Kong, or not? Yes. We are coming out of the closet, so to speak. As for Deezer's remark about girls and shoes, I have a brown leather pair I wear all the time that would fit neatly in his @$$. Tee-hee! David Dayton: I'm nice. Everyone loves me. While stumbling around the web, I found quite an interesting site, filled to the brim with MARIO UNIVERSAL CODES for AC! Here they are! Deezer: Well, I guess this is as good a time as any to list these unofficial codes. If you're planning on trying these, note that they don't always work, but will work eventually if you keep telling Tom Nook. If you want to play "by the rules," Nintendo is releasing official codes for items from the Mario furniture series via Nintendo Power. They've already released codes for a Starman and a (Bullet Bill) Cannon. David Dayton: Those are fun codes. They don't always work, though. Deezer: David and I already have toad prints. But you get an "E" for effort. David Dayton: What's a Nook's Portrait? Deezer: A small, framed picture of Nook. Hey i got another mario reference in Animal Crossing. When you get in the boat with Kapp'n, he sometimes calls you a wriggler, as in the worm thingy in smw. Deezer: Okay, that's really reaching now. I got you a Li'l Bro's shirt. Deezer: GameFAQs.com has totally drained my desire to work on game guides. I mean, with a site like that, why bother? David Dayton: Yes, yes I have. So you want another interesting letter from yours truly. Hmm. I doubt I can put the whole I don't want anything reverse psychology bit in there because I really want to win something this time. Namely the Mario trophy. I lost out on getting one in Tom Nook's lottery last month. If I lose out this time, there will be SPAM to pay. Okay maybe not. Anyways send my prize, (if any) to Bryan of Gameston. Okay now I've got some questions for you. 1. Which Mario RPG game is your preferred favorite? I like both of them. I can't really chose one over the other. 2. Did you ever get Alfonso or Louie as neighbors in your town? Also have you ever considered Cube as a possible neighbor? He may not be Mario related but he's still Nintendo Gamecube related. He wears a G logo shirt. I have Louie and Cube in my other village of Corneria. I got lucky to get those two. And how do I have another village? Well you can figure that out yourself. The answer's obvious. 3. What's your big deal about Starfox Adventures? That game rocks. One of my personal faves. 4. What is your favorite Mario item in AC? Mine so far is the Starman. And just what does the Super Mushroom do? I haven't bothered to find a universal code for it yet. 5. That guy who posted the pic of Toad in SSBM. I've actually heard that at some point in early stages of the game, (Like back when Peach was only shown on video footage at E3 2001) that Peach had the ability to throw Toad at some point. Maybe that explains it? Of course it could just be a grass field that he mistook for water. I also remember Mario 64's early stages of development had Toads in the courtyard. 6. 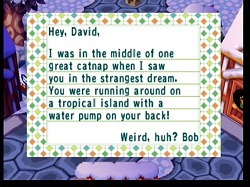 I forgot about that DK themed letter I sent you. Man was I hyped up on soda when I typed that. Your answer was hilarious. Reminds me of the stuff DKVine used to do before they shut down. Just what's your opinion on those wacky blokes? 7. In early footage of Mario Sunshine there was a nice suburban level with houses, pools, TV Satellites, and stuff like that. And there were these giant walking mushroom things that erupted the early versions of paint that you would clean up. What happened to that level? Did they turn it into Bianco Hills? They look very similar. Also the early version of Delphino Plaza looked a lot bigger than it is today. Why did they go and totally redesign the place? Couldn't they have left it as is? 8. What series of furniture do you collect for your house? I collected both Ranch and Harvest in both of my towns. Well, that's all I can think of. Give me an answer. I at least want this letter posted. Even if it's not a winner, the fact you lazy blokes have finally paid attention to my fan letters is enough of a prize. Sorta. 3. I dunno, it just didn't grab me. 4. I like the big bro's shirt. 5. That could explain it. 6. Was that in the last 'bag? I guess I forgot about it too. DKVine... don't think I've been to that site. 7. I guess they went with what they liked the best. 8. I used to collect the modern furniture, and then the Spooky furniture, and later the Harvest stuff. Since I got all the bonuses from the HRA already, I just collect Nintendo-related things and stuff for feng shui now. Today, I'm writing to ask one of you guys to look in "The Mario Trivia Game!!!" in General Mario Chat. I think you guys are the only ones besides me that can answer my question. I can't pick a favorite, but I really like the music from the original SMB, and the "Dire, Dire Docks" theme from SM64.